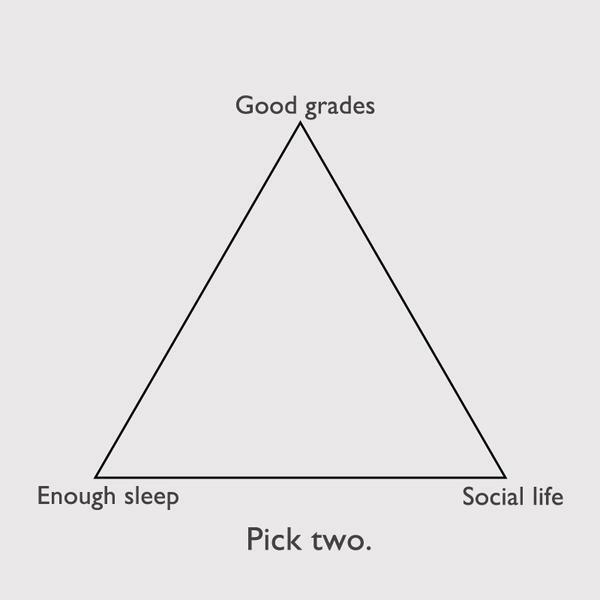 By Melissa Weiss - Features Editor · October 3rd, 2018 at 4 p.m.
It’s the meme that makes university students nod their head in agreement, a triangle as old as time: Good grades, social life, enough sleep – you can only choose two. And although the joke often yields a few chuckles and eye rolls, it has become a damaging and hard-hitting reality. According to a 2015 study, students identified the top three stressors that impact their academic success as stress (38%), sleep difficulties (26%), and anxiety (26%). In an age where these statistics seem to be ever-increasing, these numbers need to be taken seriously. For many, the answer lies in self-care. According to the Oxford English Dictionary, self-care is defined as “the practice of taking an active role in protecting one’s own well-being and happiness, in particular during periods of stress”. A quick Google search suggests dozens of self-care tips: go cloud watching, splurge a little, have a self-date, plan a two-day holiday for next weekend. There are even self-care tips geared directly towards students: make sure your body gets six to eight hours of sleep each night, eat healthy and balanced meals Meditate and practice relaxation techniques. Heck yeah. Nailed it. Clearly, I’m being facetious. On top of a full course load, I work two jobs, am part of one of the course unions on campus, volunteer on a monthly basis, and see my family and friends every once in a while, if I’m lucky. Like many students, I’m hinged to a barely-breathable budget. And also like many students, I struggle with my mental health. So what does self-care look like for me? From a personal standpoint, the seriousness of self-care may be overshadowed by its attached stigma. While so much of my future hinges on the importance of grades, it seems foolish – or even irresponsible – to make room for a bubble bath or hike up Knox Mountain. For some, the term “self-care” also elicits the feeling of mental wellness – or lack thereof. Because of this, students often minimize their need to focus on their wellbeing. Maybe they know someone who struggles with mental health, and they don’t want to be stigmatized under the same umbrella. That leads to the question, what happens when the typically suggested self-care methods backfire? 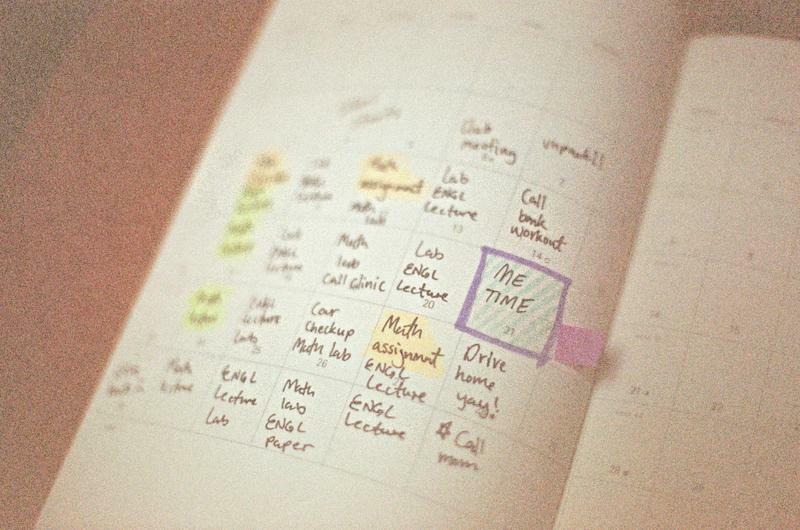 For other students who require part-time or even full-time employment to afford being a student, the demands of coursework, extracurricular activities, and a job leave little time for much else. And the stress doesn’t end once classes are over. So we can use the triangle metaphor all we want, but in reality it’s the circle we need to worry about. If you have the time, resources, and capacity for self-care, by all means, indulge- get that manicure, go to that super rad concert, spend a weekend getting lost in the woods. Sometimes, however, self-care doesn’t equate to self-indulgence. It can mean making sure you have all your reading prepared for class the night before, so you don’t have to stress about it in the morning. Or maybe it’s spending the afternoon decompressing with a friend while re-watching Gilmore Girls. Or listening to the latest Drake album on the bus ride to school. But of course, these methods might be inaccessible too. Maybe the triangle isn’t a triangle at all. At its core, self-care is about being responsible to yourself. The answer is never black and white.